You can print your own FOLD OVER or TENT STYLE Business Cards, 67# White Bristol Micro Perforated & Scored for easy Folding. Made in the USA! Each sheet makes 6 Folded Business Cards--120 Cards per Package. 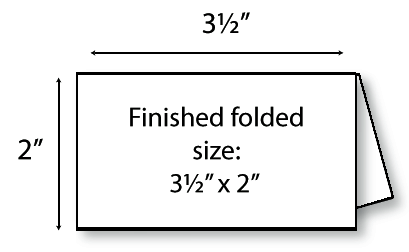 Each Card is 3-1/2" x 4", and is scored to fold to 3-1/2" x 2" (Standard size Business Card). 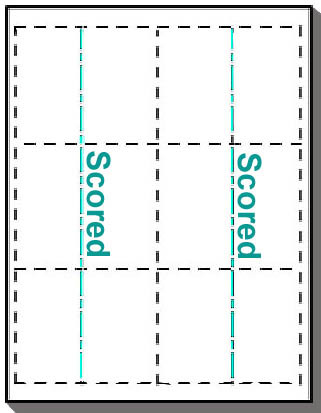 This style card has room for at least twice as much information as a non folded card. Our bright white Bristol Cardstock can be printed on both sides without bleed through. And a folded card stands out from other cards. This style card can almost be a small brochure! Call for Samples 1-800-419-2466 if needed.